Telstar 19 Vantage, or Telstar 19V, is a powerful new satellite that Telesat will place in geostationary orbit over Brazil, providing high-throughput communications to users in South America, the Caribbean, northeast Canada and the north Atlantic. Constructed by Space Systems Loral, the satellite is based around the SSL-1300 satellite bus and is expected to serve Telesat for at least fifteen years. It has a mass at launch of 7,080 kilograms (15,600 lb) – making it the heaviest payload that Falcon 9 has carried to geostationary transfer orbit. The Telstar 19V satellite will be positioned in geostationary orbit at a longitude of 63 degrees west, alongside the Telstar 14R satellite which has been in orbit since 2009. Telstar 19V carries a payload of Ka-band and Ku-band transponders. Hughes Network Systems will lease the satellite’s South American Ka-band capacity for the lifetime of the satellite, operating the transponders as Hughes 63 West. Telesat Canada acquired its fleet of Telstar satellites in a 2007 merger with Loral Skynet, a subsidiary of Loral Space and Communications which had itself been formed out of AT&T’s satellite fleet in another merger a decade earlier. The name Telstar harks back to the early years of spaceflight – when it launched in July 1962, AT&T’s Telstar was the first commercial satellite to go into orbit. An experimental low Earth orbit communications satellite, it was followed by the near-identical Telstar 2 the following year. However, once NASA’s Syncom satellites demonstrated the use of geostationary orbits for communication, Telstar and other low orbit projects were abandoned. AT&T revived its interest in operating satellites in the early 1980s, bringing back the Telstar name with the geostationary Telstar 301, 302 and 303 satellites. Telstars 401 and 402 were launched in 1993 and 1994. However, both were short-lived: Telstar 402 exploded in orbit shortly after separating from the Ariane 4 rocket that had deployed it; when the spacecraft’s propulsion system was activated, a gas leak ignited its hydrazine propellant. Telstar 401 was rendered unserviceable by a magnetic storm three years after launch. Telstar 402R, a replacement for Telstar 402, was launched in September 1995. Renamed Telstar 4 after Loral acquired the fleet in 1997, this spacecraft remained in service until its power system failed in September 2003. At the time of the failure, Loral was negotiating to sell the spacecraft to Intelsat along with the Telstar 5, 6 and 7 satellites that had launched in the late 1990s, the recently-launched Telstar 13 and Telstar 8 which was then under construction. The sale of the remaining satellites went ahead, helping to relieve some of Loral Space and Communications’ debts after the company filed for bankruptcy protection. Loral Skynet acquired Orion Network Systems in 1998, absorbing its fleet of Orion satellites. Orion 1 – which had been launched in November 1994 – was renamed Telstar 11, while Orion 2 became Telstar 12 shortly after its launch in October 1999. A third Orion satellite, Orion 3, was left stranded in low Earth orbit after the second stage of its Delta III carrier rocket failed in May 1999. Despite discussions with NASA about sending a Space Shuttle mission to boost it into a higher orbit, Orion 3 never became part of the Telstar fleet. Under Loral’s ownership, the Telstar 14 satellite was added to the constellation in January 2004 – although one of the satellite’s solar panels had failed to deploy after launch. A replacement, Telstar 14R, was deployed in 2011 and also experienced the same anomaly but was still able to enter service. In October 2007, Telesat Canada completed its acquisition of Loral Space and Communications, adding Loral Skynet’s satellites to its own fleet of Anik and Nimiq spacecraft. In 2009 the Telstar 11N satellite, a replacement for the aging Telstar 11, was launched aboard a Zenit-3SLB rocket. The first new-generation Vantage satellite, Telstar 12V, was deployed by Japan’s H-IIA rocket in November 2015. Telesat has applied this designation to their newest satellites, signifying the additional capabilities that they will bring to the company’s fleet. Telesat has also begun to look into developing a network of low Earth orbit satellites for high throughput communications. The first prototype satellite was lost in the failure of Russia’s Soyuz rocket in late 2017, with a second satellite being deployed successfully by India’s PSLV this January. To deploy Telstar 19V, SpaceX used their Falcon 9 rocket, which made its fifty-eighth flight in its single-core configuration. Falcon 9 is designed to be partially-reusable, with the first stage (or core) making a controlled landing where practical after completing its role in the ascent, to be refurbished and fly again on later missions. Despite this, Sunday’s launch used a newly-constructed booster, B1047, which was the second Block 5 core to fly. Block 5 is intended as the ultimate conclusion of SpaceX’s program of incremental upgrades to the Falcon 9 v1.2 vehicle, freezing the design with a specification that meets NASA’s criteria for human-rating the vehicle and allowing each booster to be reused many times with minimal refurbishment between flights. Previous versions of Falcon 9 were only able to fly twice, and SpaceX has now retired or expended its inventory of these earlier vehicles. A two-stage rocket, Falcon 9 first flew in June 2010 with an inert structural mockup of the company’s Dragon spacecraft, the Dragon Spacecraft Qualification Unit (DSQU). 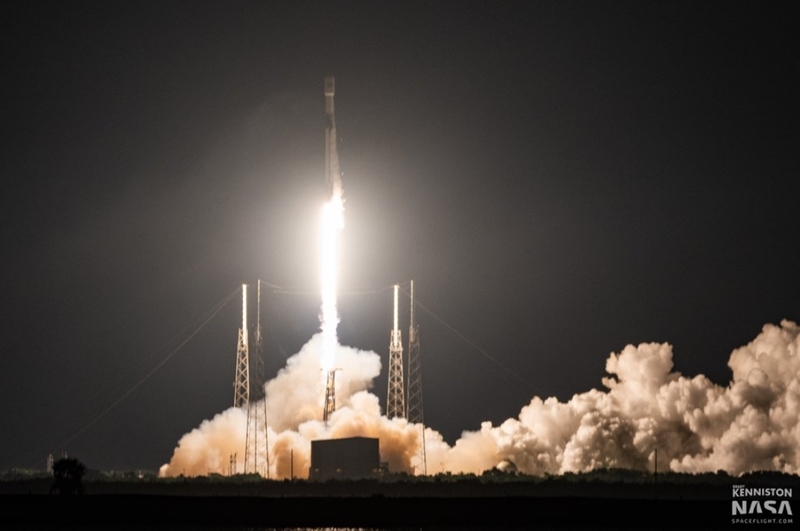 The rocket’s second launch, six months later, carried the first test flight of the Dragon capsule, which SpaceX developed for NASA’s Commercial Orbital Transportation Services (COTS) program to deliver cargo to the International Space Station. Falcon 9’s first five flights used the original design – known retrospectively as Falcon 9 v1.0 – before the stretched and upgraded Falcon 9 v1.1 made its debut in September 2013. In addition to being stretched, the Falcon 9 v1.1 rearranged the first stage engines from a square grid into an octagonal pattern known as the OctaWeb and saw the engines themselves upgraded from the earlier Merlin-1C to the Merlin-1D. These enhancements allowed SpaceX to move forward with recovery of the rocket’s first stage – fitting parachutes to the earlier version having proven a dead end. Falcon 9 v1.1 was used from 2013 until January 2016 – before it was replaced by the further upgraded Falcon 9 v1.2 that first flew a month earlier. Falcon 9 v1.2 – also known as Falcon 9 Full Thrust – expanded the range of missions on which SpaceX could attempt to recover the first stage and allowed the stage to retain enough fuel to return to its launch site on low Earth orbit missions – as opposed to requiring recovery at sea. SpaceX’s first experimental attempt to recover Falcon 9’s first stage was made during the launch of Dragon’s CRS-5 mission in January 2015, using a Falcon 9 v1.1. Ahead of the launch, SpaceX deployed its first Autonomous Spaceport Drone Ship (ASDS) into the Atlantic Ocean, the converted barge providing a surface for the core to touch down upon. The attempt was unsuccessful – the core ran out of hydraulic fluid shortly before touchdown which resulted in a hard landing that the core did not survive. A further attempt was made on the next Dragon launch. However, this saw the stage topple over on landing and explode. The first successful recovery came at the third time of asking, on the maiden flight of the Falcon 9 v1.2 with a payload of Orbcomm communications satellites. That mission saw Falcon’s first stage return to Cape Canaveral for a landing at Landing Zone 1 (LZ-1), a dedicated facility for Falcon 9 recoveries that SpaceX had constructed on the site of the former Launch Complex 13 (LC-13). 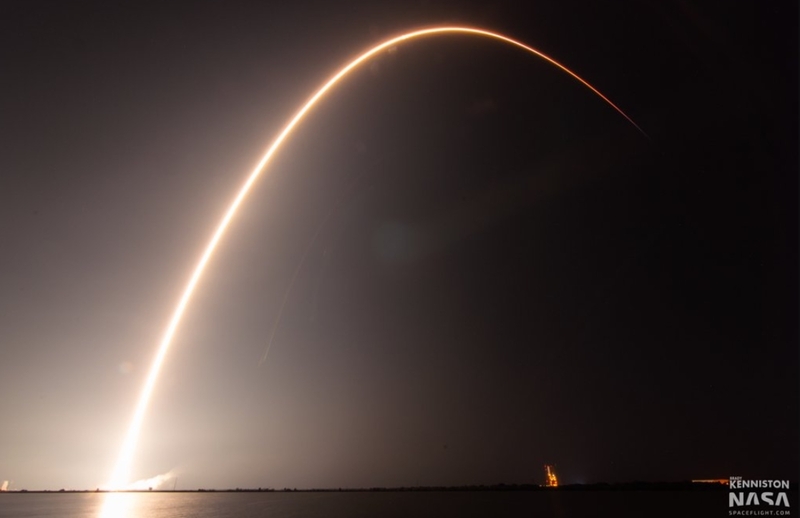 The success marked a turning point – since, SpaceX has achieved considerable success recovering its first stages both via the ASDS and at Landing Zone 1. Having mastered recovery of the first stage, SpaceX has now turned its attention to recovering the rocket’s payload fairing. Sunday’s launch recovered Falcon 9’s first stage at sea after its role in the mission was completed. Drone Ship Of Course I Still Love You (OCISLY) was positioned downrange to receive core 1047, with landing about eight and a half minutes after liftoff. In its fifty-seven flights to date, Falcon 9 has completed fifty-five missions successfully – with one failure and one partial failure which deployed its primary payload as planned but resulted in the loss of a second satellite aboard the rocket. The rocket’s only launch failure came in June 2015 when the structural failure of a support for a second stage helium tank caused the rocket’s oxidizer tank to overpressurize and rupture. In addition to this failure, another Falcon 9 was lost in September 2016, along with its payload, during ground testing ahead of its planned launch. The rocket exploded during fuelling for a static fire test, which was to have been conducted a few days before the launch of the Amos 6 satellite, with the payload already encapsulated atop the vehicle. The failure was again traced to the second stage helium tanks – or composite overwrapped pressure vessels – which were found to have buckled due to oxygen solidifying between the outer and inner layers of their structure. As well as a rocket in its own right, Falcon 9 forms the basis of SpaceX’s Falcon Heavy rocket, which uses three Falcon 9 first stage cores, topped by the same second stage. Standard cores can be used interchangeably on the Falcon 9 or as side boosters on Falcon Heavy – although the Heavy’s center core is not compatible with Falcon 9. Falcon Heavy made its first flight in February, with another mission slated to fly towards the end of the year. Falcon 9’s launch with Telstar 19V took place from Space Launch Complex 40 (SLC-40) at the Cape Canaveral Air Force Station on Florida’s Space Coast. A former Titan launch pad, SLC-40 was originally built in the late 1960s for the Titan IIIC and was later used by Titan III(34)D, Commercial Titan III and Titan IV vehicles. The pad’s last Titan launch – the penultimate flight of the Titan IV – took place in April 2005. SpaceX leased the complex from the US Air Force in 2007, demolishing the former Titan launch facilities in favor of a clean pad approach and constructing a hangar to facilitate horizontal integration of Falcon 9 close to the pad. After being assembled within the hangar, Falcon is placed onto the Strongback, a structure which transports it into position on the pad and raises it to a vertical position. The strongback provides electrical and umbilical connections between the rocket and the ground up until liftoff. A few minutes ahead of launch the structure rotates slightly away from the rocket, before falling back rapidly as Falcon lifts off. 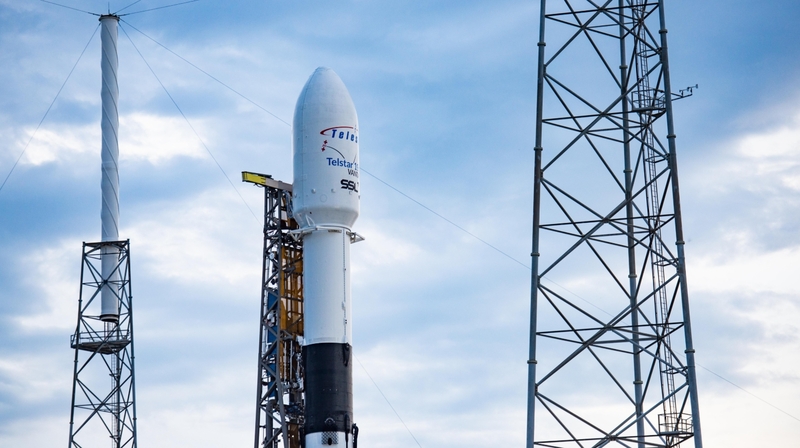 Ahead of Sunday’s launch, SpaceX began loading propellant into both stages of the Falcon 9 about thirty-five minutes before its planned liftoff. Falcon uses RP-1, refined petroleum, as propellant and supercooled liquid oxygen to oxidize it. First stage oxidizer loading began at the same time as propellant loading, with second stage oxidizer tanking getting underway at the sixteen-minute mark in the count. Topping off of the oxidizer tanks continued into the final minutes of the countdown, replacing liquid oxygen that boils off and is vented from the rocket. Chilldown of the first stage engines began seven minutes before liftoff. In the last minute of the countdown, Falcon’s tanks were brought up to flight pressure and the onboard computers conducted their final checks over the rocket’s systems. With forty-five seconds to go, the Launch Director gave the final “go for launch”. Three seconds before the countdown reached zero, the nine first stage Merlin-1D engines began their ignition sequence, building up to full thrust in time for liftoff at T-0. Climbing away from Cape Canaveral, Falcon headed East out over the Atlantic Ocean. Seventy-two seconds into flight the rocket experienced Max-Q, the point of maximum dynamic pressure where the rocket’s speed and the density of the atmosphere result in the greatest mechanical stress on the vehicle at any point in its flight. The first stage continued to burn for the first two and a half minutes of flight before reaching main engine cutoff (MECO). At this point the nine Merlin engines shut down and three seconds later the stage separated. Falcon 9’s second stage is also powered by a Merlin-1D engine, which is optimized for operation in the vacuum of space. This Merlin Vacuum (MVac) engine ignited one second after stage separation, beginning the first of two burns during Sunday’s mission. Fifty-six seconds into the burn, Falcon’s payload fairing separated from around Telstar 19V at the nose of the vehicle. The two halves of the payload fairing fell back to Earth, deploying parachutes once they have reentered Earth’s atmosphere to aid SpaceX’s progress towards recovering and re-using the fairing. 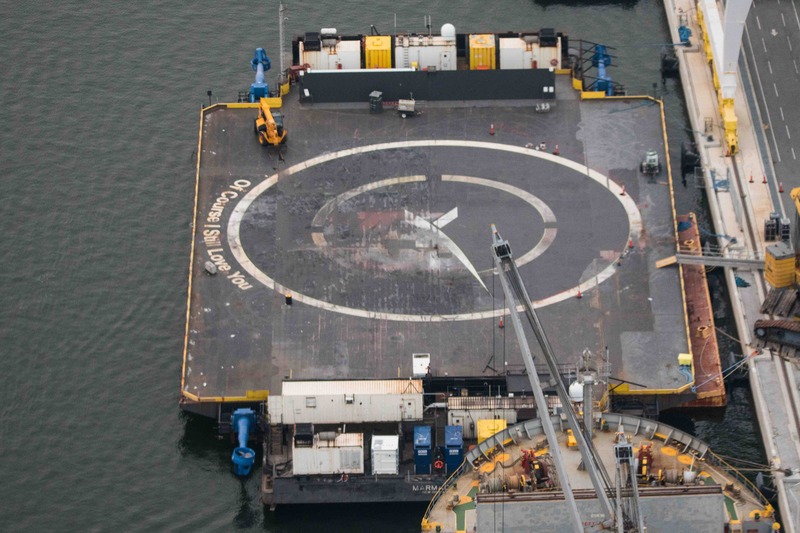 While SpaceX does not have a dedicated East Coast recovery ship, and therefore cannot catch the fairing before it hits the water, the company should be able to guide the fairing halves to a soft splashdown and then fish them out of the water. 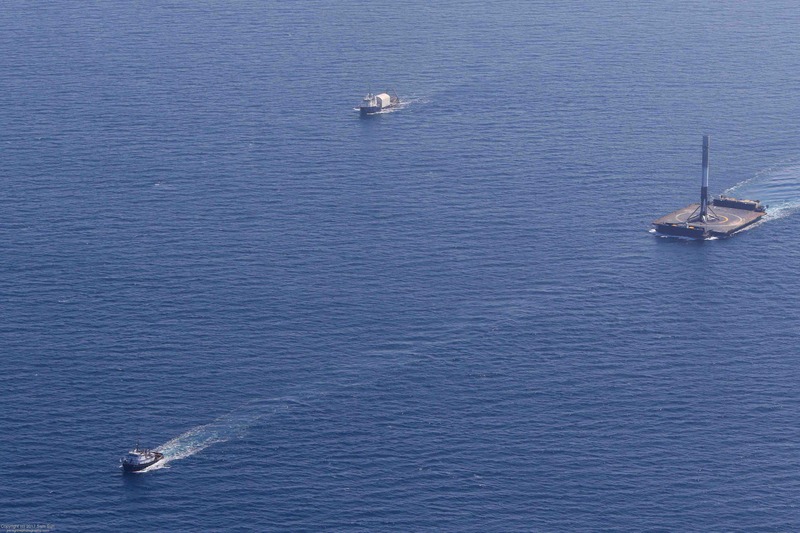 Wednesday’s planned Iridium launch from Vandenberg Air Force Base will see the next full attempt to recover the fairing aboard the boat Mr Steven. The first burn of Falcon 9’s second stage lasted five minutes and 38 seconds, placing the vehicle into an initial parking orbit. While this is ongoing, the first stage reoriented itself for reentry into Earth’s atmosphere. About three minutes and 38 seconds after stage separation, the first stage will perform a short entry burn, firing three engines to slow its velocity as it passes back into the atmosphere. Eight minutes and 29 seconds after liftoff – about seventeen seconds after the end of the second stage burn – the first stage is expected to begin its landing burn to slow itself to a controlled touchdown aboard Of Course I Still Love You. SpaceX Falcon 9 B1047.1 lands on OCISLY! After the end of its first burn, the second stage enter a coast phase, lasting eighteen minutes and twenty seconds. With this phase of the flight complete, the stage fired again for fifty seconds, raising Telstar 19V into geostationary transfer orbit. The satellite separated from Falcon 9 five minutes and one second after the end of the second burn, at thirty-two minutes and forty seconds mission elapsed time. Sunday’s launch was the first of two that SpaceX will be conducting for Telesat over the next month – with the Telstar 18V satellite currently slated for an 18 August launch aboard another Falcon 9. Falcon will make two more launches before then – with the rocket’s next flight expected to take place on Wednesday from Vandenberg Air Force Base with ten Iridium-NEXT communications satellites. Another launch is scheduled for the start of August, with Indonesia’s Telkom 4 satellite.